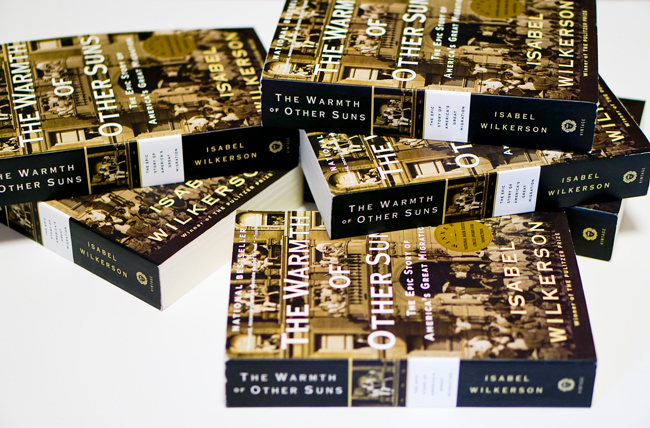 Ok readers, we've started Isabel Wilkerson's The Warmth of Other Suns. Our questions and coverage this semester will be fairly wide open so that we can identify as many possible points from the book that we would like to concentrate on for further discussion later. After reading the first 35 pages, what narrative or subject that Wilkerson raised gained most of your attention? Why or how so? The subject on Ida Mae starting around page 20 caught my eyes the most. It talked about two guys who were both interested in her at the same time based off her looks. The part that made me think deep was how the mom was just standing there peeping at the door watching these two older guys flirt with her daughter who was only 15 years of age. I think that was nonsense how many girls were made housewives or sharecropper wives early in their teenage years and the parents couldn't even do much to advoid it. I was sort of confused when George came about. I thought he was a man trying to buy her. I also figured Miss Theenie would have liked to see her go get married since it wasn't odd to get married so young but she seemed more apprehensive. Ida Mae is the most interesting subject to me this far. Her background story is interesting but I think what captivated me the most was the little snippet of her mother not liking Ida Mae's two suitors because of how dark they were (not the only reason, but still). I know that things like this still occur today and it's just hard for me to wrap my head around a black mother saying that about someone of her own race. The reasoning she gave was about the potential where jobs were concerned and friendliness with white people her daughter could have if she was with a lighter man. On page 4, Wilkerson goes into detail about how they had to prepare their children. "There was no explaining to little James and Velma the stuffed bags and chaos and all that was at stake or why they had to put on their shoes and not cry and bring undue attention from anyone who might happen to see them leaving" (Wilkerson pg. 4). This gained most of my attention because it is heart wrenching that children had to go through this. Having a compassion for helping people, kids in particular, it really makes me think of how hard it must have been to try to understand what was going on, or why they were being taken out of their usual environment. I'm actually interested in two of the narratives, Pershing Foster and Ida Mae. It will be interesting to see how Ida Mae and her children fair off in their pursuit of a new life. It was disappointing to read that Pershing Foster was never recognized in his profession, so I'm hoping to see a positive change for him. The very beginning of the book (specifically pages 8-11) were interesting to me. The Great Migration was vividly described in this section and it caught my attention. But I think the main thing that stuck with me was the exert at the top of page 8. These people were finally able to leave the south but where would they go? Wherever they went would they really be safe? Nobody really knew what to do back then but they did it. This was the start to a powerful American society transformation. To me, Ida Mae is the most interesting character for two reasons. She is a very young girl with two older suitors, and her mother just sort of lets it happen because in this time it was normal for women to be nothing but housewives, or, basically, objects of affection, even at this young of an age. It also interested me the way her mother did not appreciate the dark complexion of the suitors. This is odd because the mother is African American as well. This aspect forced me to think about racism and wonder how one could be racist to a person who comes from the same background, or even a different one. At the end of the day, we are all equal. If the mother in the story could not see that in her daughter's suitors, when they were the same, how will someone ever see her as equal? I think that the Ida Mae narrative jumped out at me because the fact that one of the reasons that her mom did not like the two suitors was because they were too black. What does that even mean? I do not think that being black should be a phrase because people interpret that in so many ways. They either have too much melanin or they are too rooted in their culture and history. It makes me think of today because people judge other people based off their skin color and some people will not date someone because they are too dark or too light and I think that the color of someone's skin should not be a factor, it should be about the person inside and how they make you feel. I found the narrative spanning from pages 28-31 to be particularly interesting. This is when George became Ida Mae's husband. I found this narrative to be relatable especially in the way Miss Theenie reacted and also her overall attitude about Ida Mae's suitors. It made me realize the differences between the times then and the current way things are. I also found this portion to be a bit comical as well. I like Ida Mae's character as she seems to have a certain tenacity about herself. Ida Mae was at interesting to me, She is very similar to myself. Just in the first couple of pages, I got a glimpse of her character. She's hard working and free spirited. The one thing that caught my eye, was the narrative in which Ida's mother doesn't like them men that Ida was considering marrying, because they were too black. Wow. I had to reread that part a couple of times, because it's so powerful. It's sometimes easy to equate racism with White people, that we sometimes forget that we too, can be racist. It's called "internalized racism", which is very damaging to not only the person, but to the community as a whole. I know many different skin tones of black, from light to dark. The thing that doesn't change, however, is our DNA. Color is just a construct that people a long time ago wanted to use to put Black people in a box. When I was younger, I never liked my skin. I wanted to be white, like my friends, because all the pretty celebrities and Disney Channel stars, were white. It wasn't until High school that I realized that Black is beautiful and that my skin does not make me who I am; It's my mind and my heart. The controversy regarding Ida Mae and her two potential love interests captivated my attention. I am African American, Irish, and Native American. Her mother did not like the two boys simply because they were darker. This reminds me of my family in several ways, the greatest of which is my mother's parents' views on "n*****s". Because of this, I have never met them nor do I ever wish to meet them. Ida Mae's situation is relateable for me which is why I find it to be the most interesting part thus far. The very beginning of the book is what really caught my attention. It starts off with the children preparing to leave. Without any dialogue, it is shown how confused the children are about where they were heading and just how times were back then. It served as a very strong and powerful intro to the rest of the book. I enjoyed the short narrative about Robert Joseph Pershing Foster very interesting. He is a doctor bound for California who cannot find work in his home state of Louisiana. This was interesting to me since I want to be in the medical field and I would like to move to California also. His family was against his trek across the country, but he saw that his life being better in a different environment since racism was not as bad on the west coast. What caught my attention was how Ida Mae acted. She wasn't like other girls in that time, she had her own mind and did what she wanted to do, not what society thought a woman should do. After reading the first 35 pages, I'm really interested in reading Robert Joseph Pershing Foster's story. His story interest me because he is a doctor that is not being recognized in his field of study, and I can't imagine how that feels. He spent years in school and in training and probably had to work harder than others just to prove himself because of the color of his skin, which is sad. I'm also going into the medical field, so I'm interested in hearing how his story plays out. To me the story of Ida Mae kept my attention the most because of her age at the time of the story. Even at the time period they were in, a grown man pinning after a fifteen year seems wrong. I seemed to get even more twisted with the fact that Miss Theenie main concern wasn't David's age per se, but his skin color and how him being with Ida Mae wouldn't really get her accepted by white society. Ida however, was firm in making her own decisions about her life and what she did with it. After reading this I am most interested in the story of Ida Mae because she seems to be so independent and is unwavering in her choice to make her own decisions considering they would be for the rest of her life, even though that was considered unacceptable back then. To me, the part in the book so far that stood out to me the most was definitely The Great Migration which began on page 8. This information shocked me immensely because although I have studied this topic in high school history, I never quite understands the calamity that this movement held. The information shared in the high school history textbook hugely under looked the magnitude of this event. For example, I was definitely not aware of the following quote: "This mass relocation would come to dwarf the California Gold Rush of the 1850s... And the Dust Bowl migration in the 1930s." I also was not aware that over the course of 60 years, six million black southerners migrated from the South. The fact that surprised me the most was that in Chicago alone the black population jumped from 44,000 before the migration, to over a million after the end of it. This surprised me the most because I am a native of Chicago, and this fact definitely impacted me immensely. To me Ida Mae is definitely the most interesting. From the beginning trying to get her two small children ready to move. To her not conforming to what it meant to be a girl and doing hard work when it needed to be done. Even the fact that her mother didn't like the guys that were trying to marry her but she didn't care. From what I've read Ida Mae is a strong independent women who does what needs to be done and that is very interesting to me. Ida Mae's story was very informative and interesting. I think that it truly shows the boundaries of the Great Migration. Through her story, i learned that she was a very independent and strong woman who fought hard in a world of men and discrimination. The concept that gained most of my attention was how Pershing Foster, Ida Mae, George Sterling, and many other African Americans decided to leave the south despite the opinions of family and friends whom did not think they should go. It takes a lot of courage to go against what your family or friends think. Because they did not conform to the opinions of others, they were able to set off and search for a better life for themselves as well as their families. I think that many of us today go to school or do many of the things that we do so that we can please our parents, friends, family members, and even society. The first few pages of this book signifies that greatness and happiness come from doing what YOU think is best for yourself and your family, not what others think. I found the first chapter and the introduction of Ida Mae and her children to be very interesting. The trip is presented in a very quiet and secretive way to the children, as it is going to be a drastic lifestyle change to the children who have grown up in a small town and don't even wear shoes around town. The characterization of Ida Mae is very interesting as well, as he is shown to be a very strong and independent woman during a time when that was looked down upon. The very beginning of the book. It was very interesting reading about totally different people going through the sames things. Multiple men decided to migrate to get away from all the unfairness. The men decided to leave first, in hopes of being getting settled then sending for the rest of their family. It had to have been a hard decision to leave your family behind in such horrible conditions. What interested me the most started on page 20 when they brought in Ida Mae from part of the historical Great Migration in 1937 into 1996 which was what I call the beginning of modern times because that was when our generation was born. Its like she serves as a bridge between two very different times as most of the elderly do. I partially view them as a special trinket from the past that we will never truly know nor experience. The narrative on Ida Mae was the most interesting to me compared to the other narratives because Ida Mae was very independent and always kept her own mindset. She didn't follow the typical girl mindset, instead she followed her own mind and I found that very interesting. I found the intro for Ida Mae interesting starting on page 19. It tells about her life in chicago and hints at the fact that it was still very different, but still better, than her life in Mississippi. It also reveals how It isn't what she expected it to be. This section really caught my attention because i became curious at her reasons for feeling the way she does. The part of the book so far that grasped my attention the most is on page 12 when the narrator is asking all of these "what if questions". She says "...If they had not gone north, what would New York look like?... What for that matter, would the south look like? Would it have changed on its own? Or did the black exodus force the South to face itself in ways that no one could have ever thought possible?" I think this paragraph on page 12 is really important because it shows just how powerful migration was and how black people really changed the country. If blacks had decided to stay in the South, life as we know it today could possibly be beyond our belief. I think those who chose to leave and start a new life in a new environment are very brave and determined. I applaud them for leaving because they wanted the chance at a better life. And it is weird to think that our current lives would not be the same if our forefathers had not chosen to sacrifice all that they had. The narrative "Ida Mae Brandon Gladney" really stuck out to me. I'm from Chicago, so the description of Chicago on the very first page of the novel really caught my eye. I really like Ida Mae as a character, because she reminds me of myself. For example, I used to be a tomboy, and I climbed trees during second and third grade. During Ida Mae's younger years she lived in Mississippi, so during that time there was still a great deal of racial inequality and segregation going on. I enjoy reading and learning about the civil rights movement and everything leading up to it, so this narrative gained the most of my attention. The most interesting part of these pages would have to be around page 24 when Ida Mae was talking about her father's illness. The whole disconnection that her family had even if for the most part white people did not live in the backwoods was very similar to today and could be easily compared to Chicago. The walls were high in the sense that if they wanted to save him they would have traverse a lot of systematic oppression. Seeing as the family did not have much of a choice the had to cut their losses and bury him which captured my attention. The most interesting part of Ida Mae's account is that of the Carter brothers. The case of the Carter brothers, from the details that was given, reminded me of that of Emmett Till. The brothers were lynched due to the circumstances surrounding a white woman. Not only does this part rings of the man laws and unspoken laws of the Jim Crow Era, it also shows a caste system that will continue to prevail. Mae also acknowledge this incident as one of the reasons that she decided to migrate out of the south. One of the things that struck me most was when Ida Mae interacted with white people. It was amazing to see how a different race could have completely different views on colored people. On page 32, Ida Mae visits the blacksmith for her father and while he was kind to her, his grown sons didn't show her the same kindness. That showed me that how one family member acts towards a race doesn't mean the rest of the family will treat that race the same way. Then on page 33 when Ida Mae was selling eggs with Miss McClenna she wouldn't be allowed in some of the white folks home. One woman referred to with a derogatory term (I am not comfortable using it because I am not sure how others will feel if I use it) and Miss McClenna was put off by it. Ida Mae said it didn't bother her and that names Miss McClenna was called didn't bother her either. She was thrown off by that comment and after that day Ida Mae never her saw her again. It shows that back in that time since Miss McClenna didn't fit in with the norm she was seen as an outcast. Even today if people are seen as an outcast they will do what they can to make themselves fit into what society views as acceptable and unacceptable. The theme that caught my attention throughout the reading was how black people were being treated. I understand that this was the Jim Crow era, however, I've never actually thought about what it would be like to living during this time. I've always had an understanding of what was going on and I've read many books on this topic. But, it is different when you're reading from the perspective of someone who is going through it. I thought that it was ridiculous how on page 5, the author talked about how the train was set up. There was one side for white people and one side for black people. What stuck out to me was his explanation for this division, "so the soles of their shoes would not touch the same stair." Black people weren't even allowed to share the same flooring as the white people on this train. I thought that this was interesting, because it was such a small detail, but it says so much about the dehumanization of the time. What caught my attention most is when Wilkerson described the Great Migration. I could picture everything being said; it was very inspirational. No one stops to think that this really happened, like Wilkerson said, "It would become perhaps the biggest underreported story of the twentieth century." Just grasping all of the knowledge coming from Wilkerson about it is just amazing. The subject I found most interesting was the talk about Ida Mae. I loved how Ida Mae was herself and was not like most other girls. Also since a lot of my family grew up in the Ida B. Wells projects it was nice to learn about her as a person. After reading the first 35 pages, I found the subject of never turning back. Throughout the reading, each character had a urgency to leave the Jim Crow south. They looked for better opportunities, even though they didn't know what to expect. This reminds me of many student's travel to college. We all came for improvement with no idea of what to expect while on the journey of achievement. What caught my attention the most in the first section was the Robert Joseph Pershing Foster narrative. This is best explained by the quote on page 7, “Perhaps he might have stayed had they let him practice surgery like he was trained to do or let him walk into the Palace and try on a suit like anyone else.” It reveals one of the key motives as to why many people sought emigration, to have an equal life with equal rights for themselves and their families. The subject that caught my attention the most was when he talked about the Great Migration on page 8. In high school I was taught a little bit about the great migration when we were talking about the years after slavery. I thought it was interesting to read about the subject from a different point of view, rather than reading from a textbook how black Americans were gradually pushing white people out of cities that were then predominately white, such as East St. Louis. The subject matter in general grasped my attention. However, what I found most interesting is how parallel the characters migration stories were, at least initially. How they literally made the decision to leave despite all odds and simply went on their way, not knowing what to expect just knowing that they were in search of something better. This reminds me a lot of how college is, at least how my college experience was. Stepping out, going to a new place in search of the means to be able to make a better life for myself. In my case for educational purpose and in their case for a whole new life.